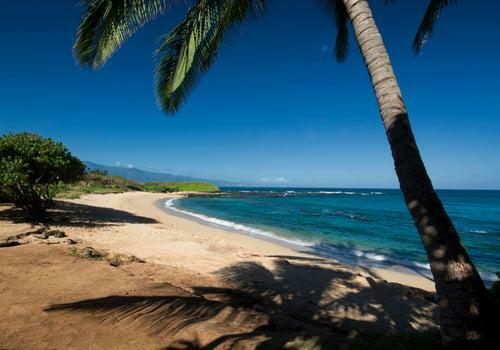 Located on Maui's North Shore, Tavares Beach is also known as Lamalani Beach. This crescent white sandy beach is in the area of Kuau. It's just the right size for locals and visitors during the week days, but weekends can get fairly crowded. Families with small children really like this beach. Watch for rocks in the water, but it's a great beach for snorkeling, swimming, spear fishing, wind surfing, surfing, and rock jumping. With a reef close to shore, it helps to keep the waves from breaking too near the shoreline. Further out there is another surf break, making it a really nice place for surfing. However, the waves tend to become more extreme during the winter months. Experienced surfers may relish the waves, but inexperienced surfers should beware. Sometimes there is more seaweed here at different times of the year, so just watch for it. The beach isn't marked, except for a "Beach Access" sign. It's about one-half of a mile past Paia's traffic light along the Hana Highway (Highway 36). Another marker is the beach house with the blue-tiled roof next to the parking lot. You may hear the name of this beach as "Blue Tile House Beach" if they don't know the real name. There are no facilities, except a port-a-potty.